Nightlife in Sperlonga revolves around the bars in the main piazza, while in the day it'll surprise you with white sand and crystal clear water. That' why Sperlonga has been awarded Blue Flag by the FEE, Foundation for Environmental Education for over 16 years now..
Terracina is halfway between Naples and Rome and has a beautiful 6km-long promenade by the sea. 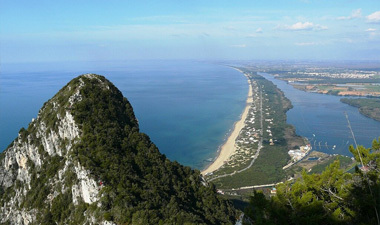 Nearby, San Felice Circeo with all its finds related to the myth of Ulysses and Circe, and the Parco del Circeo, a famous cultural and naturalistic attraction. 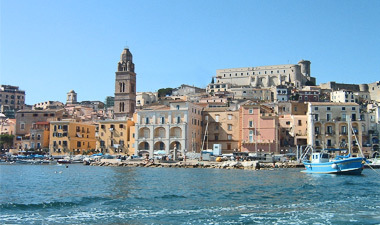 Gaeta is one of the main Italian summer destinations. This small town is famous for the myth of the Argonauts and for Aeneas, and has a lot of beautiful bays and coves to offer. 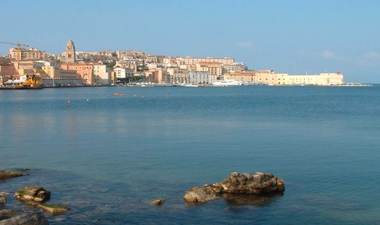 Nighlife, street markets and promenades, churches and monuments, natural beauties is what you can expect from Gaeta. Don't miss the Montagna Spaccata ("cracked mountain"), a walkable crevice with a long and sheer stairway leading to a breath-taking view. Legend has it that Formia was a stop-over of the journey of Ulysses. One thing is for sure, Formia was an important destination for Roman patricians, so the whole area offers a lot to see in terms of archaeological finds. Some of the main tourist attractions in Formia are the Archaeological Museum and the Tomb of Cicero, the churches of San Luca, Madonna del Carmine, Santa Teresa, Santi Giovanni Battista e Lorenzo, Sant'Erasmo. The Pontine Islands can be easily reached from Formia. The smallest island, Ventotene, is a small piece of Heaven, which shores are much appreciated by scuba divers. The main diving spots are Punta Pascone, Secca dell'Archetto, Punta dell'Arco and the wreck of the Santa Lucia. 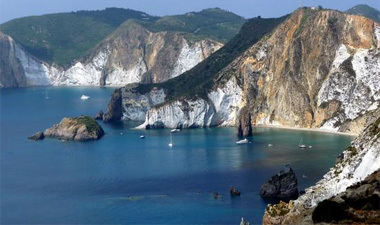 Other destinations are the Island of Santo Stefano, Ponza and the smaller islands of Palmarola, Gravi and Zannone. Don't miss the beaches of Chiaia di Luna and Le Felci, Frontone, Lucia Rosa and its natural pools, Cala Feola and the views of Cala Fonte.